Brainstorming YouTube video ideas can be tough. And if ideas aren’t coming to you, that can eat away at your motivation. 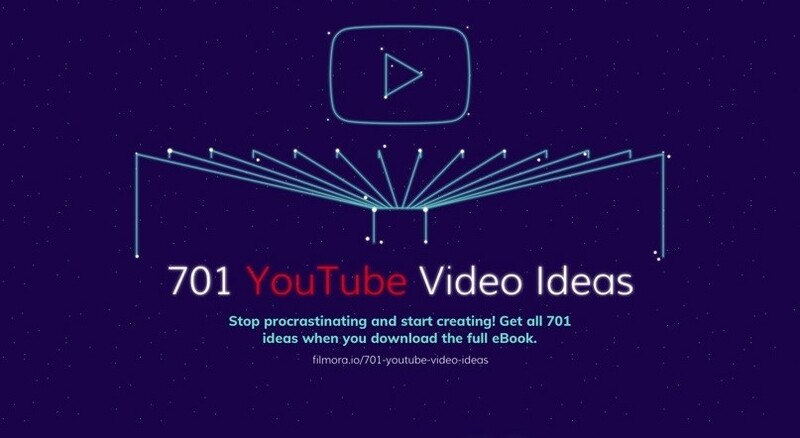 In order to save you time and energy, and to help you stay enthusiastic about YouTube, filmora.io created both an infographic with 701 YouTube video ideas and the free 701 Video Ideas eBook. Scroll down to find the infographic. Plus, below are five tips that can help you generate even more of your own original YouTube video ideas. If you think you have an idea, don’t let it get away! By carrying a notebook (or using your phone to record notes) you’ll be ready to capture ideas when they come to you. Never assume you’ll remember an idea later. You might, but you might not. Knowing that you are ready to record ideas, as well as being in the frame of mind that you are hunting down ideas and inspiration, will help more ideas to come to you as you go about your daily life. Writing ideas down may even prompt you to come up with similar ideas. Instead of having a couple ideas while waiting in line at the grocery store and then forgetting one by the time you get home, you’ll end up with a nice list of thought-starters. You don’t always have to look outside yourself for ideas. Viewers on YouTube love getting to know the creators they follow. So when you’re stuck for ideas, the easiest thing to fall back on might be to tell your audience a bit more about yourself. If you have a gaming channel, for example, you could post a video about your favorite five games. Alternatively, you could get specific and choose a top five with a theme, like horror. If you have a tech channel, you could do a “What’s on My Phone?” video showcasing your favorite apps. Even if you have a lifestyle or vlogging channel where you already talk about your life, there’s probably something you can share with your followers that you haven’t yet (so long as it’s something you’re comfortable with). What’s a book that inspired you? Did you enjoy high school? It’s easier to come up with ideas for a niche channel because you’re more focused when you’re brainstorming. Also, your niche will usually be something you’re passionate about or something that directly relates to your life. For example, if you like baking and you also love comic books, then you could make a comic-themed baking channel where you make things like Spider Man cupcakes. Zooming in on something you really care about makes ideas come more easily. Sometimes it can be hard to come up with video ideas just because you’re too busy, or your mind is focused on something else. If you are constantly playing games, or scrolling Instagram, or talking to friends, then maybe those things could inspire you with video ideas. Sometimes, though, it’s a good idea to go on a nice long walk by yourself. Or sit on your porch and watch the sun set. Try giving yourself time just to breathe and not think of anything in particular. Let your mind wander to the most random places, and that’s where you’ll find some of your best ideas. Choose five ideas from the graphic above. Or read the 701 Video Ideas eBook. Then write your five ideas across the top of a piece of paper. On the right side of the paper, make a vertical list of five things you love (that are somewhat related to your YouTube category). Make this into a grid. Look at the places where the ideas and the things you love intersect. Consider whether there are potential videos there. Sometimes there are, sometimes there aren’t, but even when there aren’t, answering the question, “Why not?” can sometimes lead you to some video ideas. Combine the ideas in this infographic, or the 701 Video Ideas eBook, with these methods of brainstorming. You’ll then be able to come up with an endless supply of video ideas for YouTube. If you’re never stuck for video ideas, you’ll be able to post new videos more often. Posting on a consistent schedule can be the key to attracting subscribers and growing your channel faster. Success on YouTube has a lot to do with whether or not you can come up with lots of ideas. And—by using these methods and free resources—you can!